The Java String.equalsIgnoreCase method is one of the Java String Method which is used to compare this string with user specified string to check whether they both represent the same sequence of characters or not, and based on the result it will return Boolean True or False. Remember, while comparing two strings, this method will ignore the case differences (Case sensitivity). In this article we will show you, How to write Java String equalsIgnoreCase method with example. Before we get into the example, let us see the basic syntax of the string equalsIgnoreCase in Java Programming language is as shown below. The following Java String equalsIgnoreCase method will accept the string data as the argument and perform case-insensitive comparison on existing string with this new string to check whether they are equal or not. another_String: Please specify the valid string. This is the string we are going to compare with String_Object. 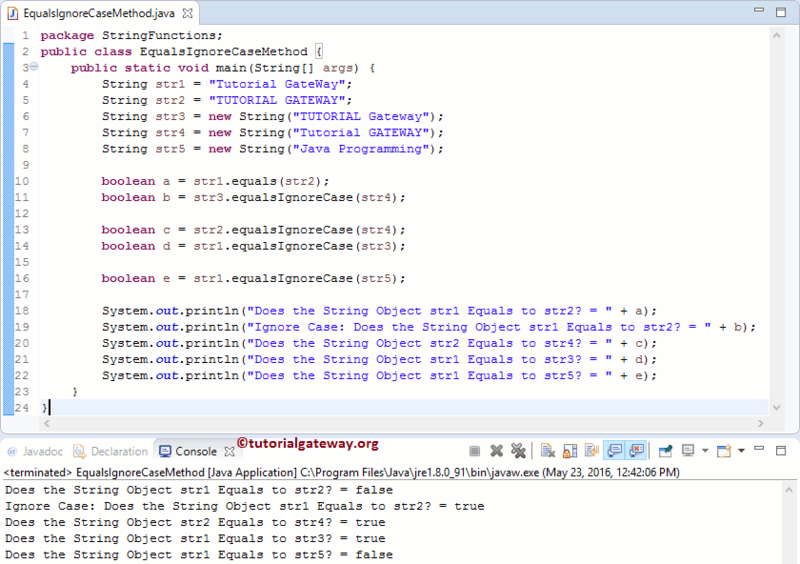 The String equalsIgnoreCase in Java is used to check whether this string and user specified one is equal or not. In this Java program, We are going to find the same. The following Java String equalsIgnoreCase statement will call the public boolean equals (Object Obj) method to compare the string str1 with str2. From the above screenshot you can observe that, it is returning False because they are different in Case. Following statement will call the public boolean equalsIgnorecase (String another_String) method to perform case-insensitive comparison on string str1 and str2. From the above screenshot you can observe that, it is returning TRUE because they both are equal. Next, we used the Java If Else Statement to compare the user entered string with the String Object “Tutorial gateway” and check whether they are equal or not.